So, why do I love them? 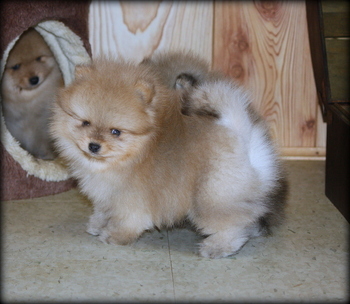 When I got my first Pomeranian puppy many years ago, he totally stole my heart! Even after breeding them for over 25 years, I still love them as much as I did that first puppy I bought. They are my "happy" little dog! They love everyone and everything, and they get always get excited when they see you! They all have bubbly attitudes and love life! They make wonderful companions, even in small living spaces, since they are also small and compact. They are great traveling companions also! They get along with other pets, including dogs, cats, and other little animals. You do have to be careful with this breed since they have NO fear of anything. They have a bubbly sense of humor, too, so they bring so much joy to your life! They are naturally alert, curious, and attentive, which makes it nice. They learn new things quickly, so they are easily trained. They are a big dog "trapped in a little body"! They do think they are a big dog, and they are very independent. They just have that wonderful, happy spirit that will make you laugh! Signs of hypoglycemia include lack of energy, weakness, shivering, disorientation, stupor, and "drunkedness". It does occur in many small breeds, but can be controlled if you look for these warning signs. It usually occurs when a puppy is "super tiny". I always provide new owners with a extensive document about Hypoglycemia, as well as many tidbits I have learned over the years. 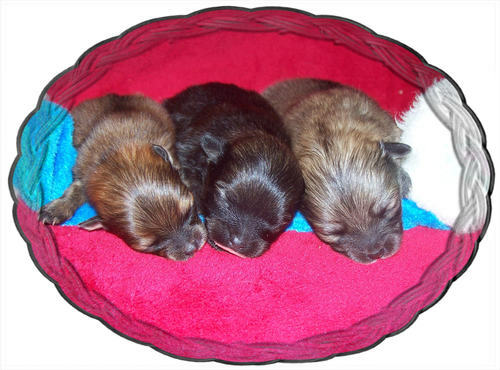 I will not release any puppy if he/she has any signs of Hypoglycemia.